Guinea pigs can make great family pets! But are you wondering how to tame a guinea pig? To help you get better acquainted with your pet, we’ve put together this helpful guide! Aren’t guinea pigs naturally curious and friendly? Well, yes they can be. These little furry critters are undoubtedly cute and full of personality, but they can be a little nervous of people to begin with if they’re not accustomed to being handled. When considering how to tame your guinea pig, much will depend on his individual personality. Guinea pigs are naturally nervous in strange situations because they are prey animals. Consequently, they sometimes have a very strong “flight” response when they feel threatened. This is especially the case with guinea pigs that have not been socialized from birth. For this reason, guinea pigs bought from a home breeder tend to be friendlier and less anxious than those acquired from pet shops. Some piggies can be nervous and skittish around people, so for their happiness and yours it’s important that you dedicate plenty of time to taming your pet. A tame guinea pig will come when you call him, enjoy being handled, and can even learn simple tricks. So, you can see that your efforts to tame your guinea pig will be repaid many times over! Now, let’s take a closer look at taming guinea pigs with our step-by-step guide on how to tame a guinea pig! 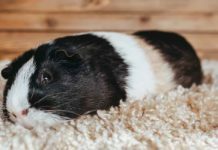 Before you begin the process of taming your guinea pig, you’ll need to create an association between you and your pet’s favorite treats! Fresh veggies and small pieces of fruit are an ideal temptation that your piggy will find hard to resist! Before you begin each taming session, remove any toys or other obstructions from the cage or enclosure so that your guinea pig doesn’t have a ready hiding place. You’ll want to have nothing between you and your pet. This helps to focus the guinea pig’s attention on you and on the tasty reward you’re offering him. Here you go – a step by step guide to taming your guinea pig! Start by approaching your guinea pig’s cage or enclosure a few times each day. Chat quietly to your pet while you’re tidying the cage or placing water and food inside. At this stage, don’t try to touch or handle your guinea pig. Once the guinea pig is used to your presence beside and around the cage, talk quietly and softly to your piggy and offer him a treat. If the guinea pig takes the treat from your fingers, that’s great! If your guinea pig is skittish and won’t take the treat from you, walk away and take the treat with you. Repeat the process of offering treats several times each day, until your guinea pig comes to you to take the treat out of your hand. This stage can take a week or more, so you must be patient! Usually, guinea pigs will quickly overcome their reservations and come to you for food. You may find that offering treats before you put regular food into the cage will help! Don’t leave treats in the cage so that the guinea pig can just wait until you’ve walked away, and then help himself! Continue to hand-feed your guinea pig until he’s confident to approach you. Once the piggy forms an association between you and his favorite snack, he’ll come running when he sees you! Now that your guinea pig is happy to nibble a treat while you’re holding it, you can begin gently petting him. To start with, use one finger to gently stroke your pet’s side. Don’t lift your hand over him, as this could frighten him! Once you guinea pig is happy to let you touch him, you can pick him up and take him out of his cage. Place your pet on your lap and give him a treat. Stroke your guinea pig gently and talk softly to him while he’s enjoying his treat. This experience should be pleasurable for your pet. And once again, he’ll associate being handled with being given his favorite treat. Repeat this process several times each day until your pet is comfortable with being handled. Limit these handling sessions to a maximum of 10 minutes. An essential aspect of how to tame a guinea pig is learning how to handle him correctly. When handling your guinea pig, it’s vital that you do so correctly so as not to alarm or hurt your pet. 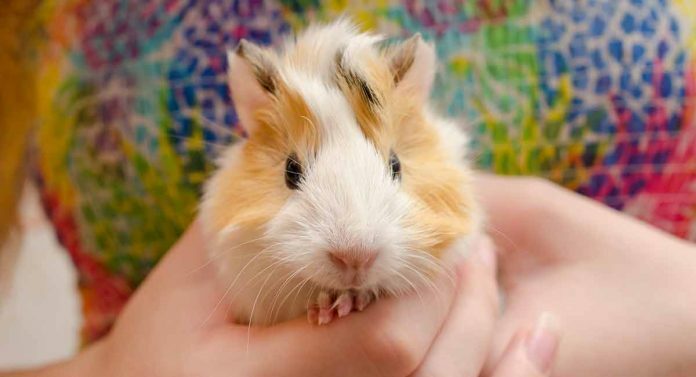 To pick up your guinea pig, place your right hand across his shoulders – Do NOT squeeze! Put your right thumb behind your pet’s front legs. Now put one or two fingers in front of his front leg and the other two fingers behind it. Now put your left hand underneath your guinea pig’s bottom so that he’s fully supported. Lift your guinea pig up horizontally, being careful not to let his back legs dangle. If he fidgets or struggles, hold his back legs still with the fingers of your left hand. Avoid holding your pet vertically, as this could hurt his back. Once you’ve lifted your guinea pig off the ground, cuddle him close to your chest. This will help your pet to feel safe and secure, and he will be less likely to panic and struggle. When placing your guinea pig back into his cage or down onto the floor, always do so with his bottom facing first. If your pet can’t see where he’s going, he’ll be less likely to try to take a flying leap out of your hands, which could result in him injuring himself. If your guinea pig begins to struggle after you’ve been holding him for a few minutes, it’s possible he might need to pee. Always put your guinea pig down if he wriggles so that he doesn’t become stressed or uncomfortable. So, that’s it! You now know how to tame a guinea pig! The key to taming your guinea pig is patience and persistence – and of course a ready supply of his favorite treats! Always choose a time for handling and training sessions when you’re not in a hurry. 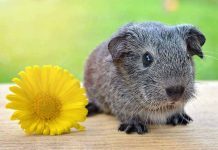 Guinea pigs are very sensitive to their owner’s mood, and if you get flustered and try to rush things, your taming sessions are unlikely to be successful. 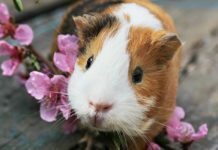 Taming your guinea pig – how did you do? We’d love to know how you got on with taming your guinea pig! Did you discover a particularly tempting treat that your pet loved? Or perhaps you found a really good way of overcoming the reservations of a particularly nervous piggy. 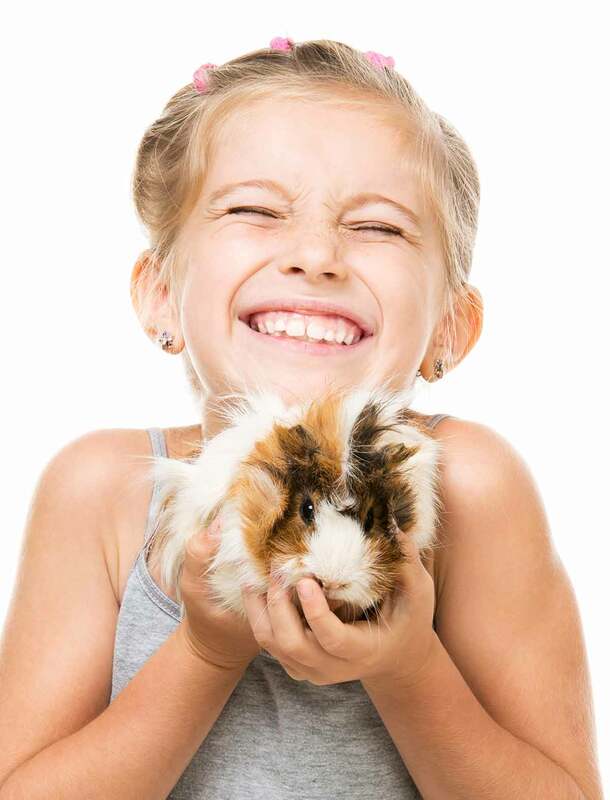 Why not tell us about your guinea pig taming experiences in the comments section below! Academic Health Center Research Services. Blood collection guidelines. University of Minnesota. Ontario Society for the Prevention of Cruelty to Animals, Guinea pig care. Previous articleCan Guinea Pigs Jump? And If So, How High? Next articleGuinea Pig vs Rabbit – Which Makes The Best Pet?